When we talk about “the cornerstones of American cinema”, only a select few films lay true claim to the title– films like Orson Welles’ CITIZEN KANE (1941), Alfred Hitchcock’s VERTIGO (1958), or Billy Wilder’s SUNSET BOULEVARD(1950). These are some of the greatest films of all time, made with an impeccable craftsmanship that has endured through the decades and survived countless filmmaking trends. 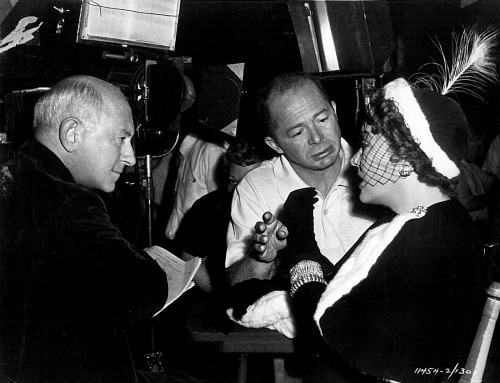 Wilder in particular was hailed for his strengths as a screenwriter, and as such, SUNSET BOULEVARD arguably boasts the best writing of any film of this caliber. Lines like “I am big. It’s the pictures that got small”, or “I’m ready for my closeup, Mr. DeMille” have become ingrained into our cultural subconscious, becoming synonymous with the medium of film itself. Despite being made nearly seventy years ago, SUNSET BOULEVARDhas lost none of its macabre, biting edge. The same underhanded promise of glamor, luxury, and fame still brings in a fresh busload of wide-eyed transplants to Hollywood each and every day. That shimmering apparatus we call “The Dream Factory” was built by a rogue’s gallery of egotistical hucksters, craven hedonists and byzantine grotesques, and Wilder’s lifelong fascination with these shadowy figures lurking between LA’s sun-soaked avenues culminates with SUNSET BOULEVARD– a legacy-defining masterpiece that will haunt the cinema for ages to come. As the tumultuous 1940’s drew to a close, Wilder found himself on top of the world. Not only was he an Oscar winner, he was also regarded as Paramount’s most valuable filmmaker. On top of that, he was once more a newlywed, having just married singer Audrey Young following a courtship that began on the set of 1945’s THE LOST WEEKEND. His status as a member of the Hollywood elite meant that he spent a great deal of time in the parlors of LA’s grand mansions, some of which belonged to retired, reclusive stars of the silent era. He found himself inspired by this strange, somewhat-sad scene, and began working on a new script with his longtime writing and producing partner Charles Brackett. They were careful to tread lightly, as such an inside look at Hollywood’s seamy underbelly hadn’t really been attempted in this intimate a fashion before. Towards this end, they enlisted the help of a third writer, D.M. Marshman, who had written a critique for THE EMPEROR WALTZ (1948) that Wilder and Brackett strongly responded to. 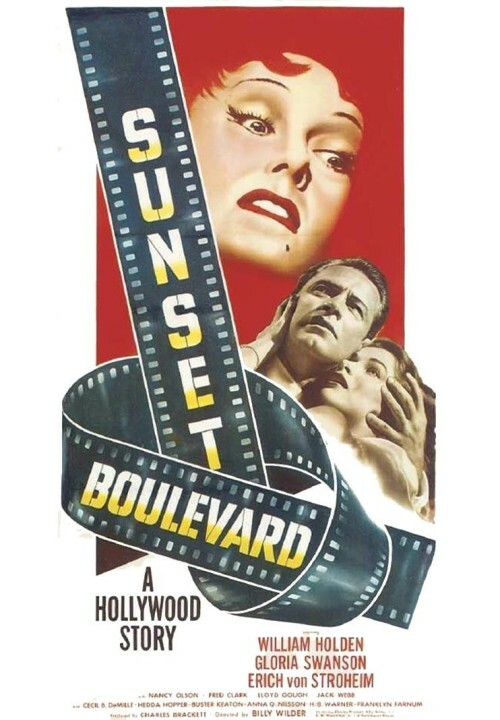 Despite SUNSET BOULEVARD’s nature as an insider’s industry expose, Wilder and Brackett met with very little resistance from Paramount Pictures, who even went as far as far as encouraging them to use Paramount’s real name and facilities instead of a fictional substitute within the narrative. SUNSET BOULEVARD begins at the end, with an image of a dead man floating in the pool of a grand estate located just off the eponymous drag. The dead man is Joe Gillis (William Holden), a fact revealed to us by Gillis himself via posthumous voiceover. After setting up his current… “predicament”, he then takes us back to the beginning of his story, which finds him in the midst of flaming out of his screenwriting career. He hasn’t booked a new gig in quite a while, and the repo men are circling like vultures around the car he’s been unable to make payments on. They finally catch up to him one day while out on a drive, resulting in Gillis blowing a tire during the ensuing chase. He escapes by rolling the car into the garage of a huge, decrepit mansion that looks like it hasn’t been inhabited for many years. To his surprise, he finds the house is occupied by Norma Desmond (Gloria Swanson), an old star from the silent era, and her ghoulish butler Max Von Mayerling (Erich Von Stroheim). When she discovers he’s a screenwriter, she offers to forgive his intrusion if he’ll give her notes on a screenplay she’s been developing on her own to serve as her grand return to the cinema. As Gillis expects, the script is objectively terrible, but he offers to take on the task in exchange for a hefty payday and a short-term residency at Norma’s opulent estate. Growing quickly dependent on Norma for shelter, clothing and money, Gillis eventually realizes he’s a kept man— a sexual prisoner beholden to Norma’s suffocating vanity and wealth. In a bid to reclaim his agency (and his sanity), he starts sneaking out in the middle of the night to collaborate on a romance script with a beautiful young studio reader (Nancy Olson) who he also happens to be falling in love with. When Norma catches on to Gillis’ deception, she embraces her delusion and jealousy by taking action that will bring the story back full circle to its murderous introduction. SUNSET BOULEVARD is a brilliant portrait of Hollywood’s natural megalomania and self-deceit– traits that aren’t surprising given the fact that the entire enterprise of filmmaking could be cynically boiled down to grown men and women playing make-believe for absurd amounts of money. It’s a particularly meta example of art imitating life, but the film gains another degree of resonance in that it’s also an example of life imitating art. Wilder’s cast is essentially comprised of burnouts, most of whom were then engaged in a drawn-out period of decline following once-lustrous careers. All four of his main cast members are playing somewhat exaggerated versions of themselves (and to their credit, each of the four were rewarded with Oscar nominations). William Holden had been regarded nearly a decade prior as a major new talent to watch, only for his buzz to fizzle out rather anticlimactically. In that way, that experience made Holden the ideal candidate to play the talented, yet hungry, screenwriter Joe Gillis. Holden wasn’t Wilder’s first choice (Montgomery Clift went back on his original commitment to star only two weeks before production, and Wilder’s appeals to DOUBLE INDEMNITY’s Fred MacMurray were turned down outright), but his refined grit and dry gallows humor made him a natural fit for the part. Holden’s naturalistic, low-key performance is contrasted against Gloria Swanson’s grandiose, kabuki-style theatrics. She turns in one of the most unforgettable performances in the history of the medium, channelling no less than Count Dracula in her attempt to communicate Norma’s delusions of grandeur and vainglorious imperiousness. She slinks and slithers through the film, a vampire sucking on the lifeblood of those in her orbit to feed her own narcissism. As a former silent film star herself, Norma Desmond’s overarching attempt to mount her big comeback is a plot device that hits close to home for Swanson. She was ultimately unable to make much of a comeback herself, and would retire from the cinema altogether in 1974, citing that the only offers she received were to play lesser variations on her character here. Newcomer Nancy Olson’s natural wholesomeness draws a nice contrast to the dusty theatrics of Norma Desmond and makes her convincing as Holden’s optimistic young love interest, Betty Schaeffer, while Erich Von Stroheim’s stern ex-husband-turned-butler Max Von Mayerling mirrors his own career trajectory as a disgraced silent-era director whose films actually featured a younger Gloria Swanson. Finally, Wilder mischievously stunt-casts real Hollywood icons like Cecil B. DeMille and Buster Keaton to play themselves, grounding the macabre theatrics of the plot in a realistic world the audience can recognize. SUNSET BOULEVARD is often characterized as a noir, building on the aesthetic innovations Wilder established in DOUBLE INDEMNITY. On closer look, however, it actually starts to resemble something more akin to the classic Universal horror films. The exaggerated chiaroscuro and gothic haunted-house iconography of those films are given a distinctly Californian twist, which makes the monsters residing within all the scarier because they actually exist. After sitting out Wilder’s previous two features, John Seitz returns as cinematographer, ably capturing the director’s shadowy, monochromatic vision onto the 1.37:1 35mm film frame. SUNSET BOULEVARD sees continued instances of Wilder exploring his understated visual aesthetic, with many of his compositions emphasizing depth of focus as well as employing subtle framing devices like mirrors and reflections as a way to add intrigue while minimizing the need to cut. Wilder’s camera is always motivated by the movement of the subject or actor, but the moves themselves exhibit a growing comfort on his part with grandeur and kinetic energy. He uses the formalistic signatures of Golden Age moviemaking (dollies, cranes, and soundstage process shots), but he also incorporates newer, less formal techniques like whip-pans during action sequences. Seitz’s moody cinematography is given weight and authenticity by the darkly ornate production designer by Hans Dreier and John Meehan. The cavernous interiors of Norma’s mansion are depicted like Dracula’s castle, with the numerous candelabras, heavy drapes, and stone tiles choking out any natural sunlight. This idea is further reinforced by Edith Head’s garishly glamorous costumes, which call to mind a vampire’s draping cloak just as much as they do the byzantine indulgence of the silent era. Interestingly enough, the decrepit mansion itself (of which only the exteriors were used) was not located on the titular street of Sunset Boulevard– it was instead located to the south in Hancock Park, along Wilshire. While this fact is understably attributable to practical and aesthetic production reasons, it also points to cinema’s ability to join distant geographical points together into a convincing temporal continuity via the magic of montage. Towards this end, editor Arthur P. Schmidt proves a capable substitute for Wilder’s longtime editing partner Doane Harrison, intuitively placing strategic close-ups within Wilder’s otherwise-minimal coverage to maximum effect. SUNSET BOULEVARD’s last shot is easily the most skin-crawlingly sublime of these close-ups, which sees the Norma Desmond character– completely surrendered to her fantasy– break the fourth wall to acknowledge our presence directly as “those wonderful people out there in the dark”. Finally, Franz Waxman, one of Wilder’s oldest and best friends from Europe and the composer for his first feature MAUVAISE GRAINE (1934), returns with a tense score that subverts the brassy orchestral sound of Hollywood convention with a frenetic dissonance. SUNSET BOULEVARD’s story feels just as relevant today as it did back in 1950, its timelessness owing to Wilder’s fascination with resonant thematic material. Wilder’s general approach to filmmaking reflects his belief in the primacy of the screenplay, an observation that’s supported by the fact that his protagonists are often writers themselves. Just like THE LOST WEEKEND before it, SUNSET BOULEVARD concerns itself with the trials of a struggling young writer– a narrative device that makes for a smooth pivot to explorations of class conflict, another Wilder signature. Wilder takes every opportunity to juxtapose Gillis’ ragged poverty against Desmond’s vainglorious decadence– like his tiny, cramped apartment versus her sprawling mansion, or his car getting repossessed because he can’t make the payments while she owns an expensive antique she barely even drives. This dynamic creates a mutually dependent, symbiotic relationship– she needs his companionship in order to perpetuate her own delusions, and he needs her material fortune in order to stave off the complete collapse of his screenwriting dreams. This burgeoning “kept boy’ aspect of Gillis’ identity becomes a major source of internal conflict for him. Their unconventional relationship is made all the more bizarre by the Hays Code’s disapproval of onscreen sexuality, but Wilder had built up a reputation for walking that fine moral line in increasingly-creative ways. SUNSET BOULEVARD is one of the rare instances where imposed censorship actually works in the film’s favor, wherein the simple implication (rather than a literal depiction) of a deviant sexual relationship actually enhances the unnerving tone Wilder was worked so hard to create. SUNSET BOULEVARD marks the end of an era for Wilder, who decided to call it quits with his writing partner Charles Brackett after collaborating on seventeen screenplays together. Considering the strength and duration of their partnership, Wilder’s reasoning for separation arguably comes off as quite petty– the two had allegedly sparred over how to execute the montage sequence where Norma undergoes several extreme makeover procedures to prepare for what she expects will be her grand return to the silver screen (1). For what it’s worth, Wilder and Brackett’s final partnership would end on a high note, both critically and financially. While the film had a healthy (if not groundbreaking) run at the box office, critics coalesced around a consensus that still holds firm today: that SUNSET BOULEVARD is a stone cold masterpiece. Despite being a damning self-portrait of Hollywood and “The Dream Factory”, SUNSET BOULEVARD was widely embraced by industry tastemakers, going on to several Academy Award nominations in key categories like Best Original Screenplay, Music Art Direction, Cinematography, Supporting & Lead Actor and Actress, Direction, and Picture. Wilder and Brackett’s last joint screenplay would go on to win the Oscar, as would Waxman’s score and Dreier’s production design. WhileSUNSET BOULEVARD would ultimately lose out to Joseph L. Mankiewicz’s ALL ABOUT EVE (1950) for the top prize, Wilder’s effort was recognized with a far greater reward when it was among the first group of films selected for preservation in the National Film Registry in 1989. Wilder’s filmography consists of numerous iconic classics, but SUNSET BOULEVARD towers over all of them as his defining work. To put it another way, it is the cornerstone of his legacy as a filmmaker. Whereas many films from this era are regarded today as relics, SUNSET BOULEVARD stands instead as a monument to the twentieth century’s dominant art form, beckoning a whole new generation to come try their luck at living the dream in the City of Angels. SUNSET BOULEVARD is currently available in high definition Blu Ray via Paramount.